Harry Potter has some new competition with the release of Billy the Wizard: Rocket Broomstick Racing. Players can choose from eight young wizards-in-training before hitching a ride on a rocket-propelled broomstick and soaring across the skies. Multiple activities include collecting flying spell books, defeating a specific number of dragons, and racing against up to three human or computer opponents. 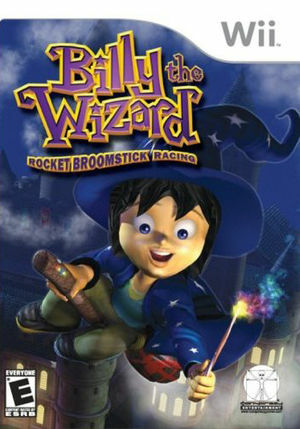 Characters can fire magic-based projectiles to hinder the competition's progress as they navigate through rings in the "Broomstick Grand Prix." Over 30 levels of high-flying high jinks await players across six game modes. The graph below charts the compatibility with Billy the Wizard: Rocket Broomstick Racing since Dolphin's 2.0 release, listing revisions only where a compatibility change occurred. This page was last edited on 12 October 2017, at 22:20.